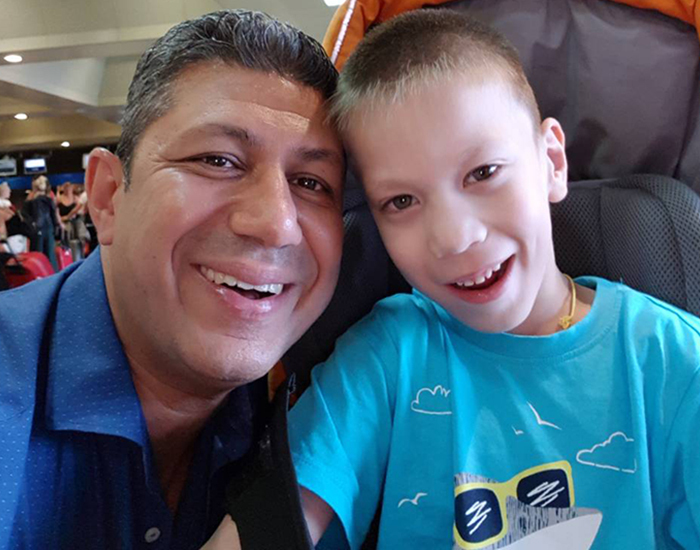 In December 2016, Greek orthopaedic surgeon Nikolaos Rigopoulos travelled to Moscow to make free examinations to many children with cerebral palsy. One of the patients was a 6-year old Ilya, who had serious consequences after an intracranial haemorrhage in 2010, extensive ischemia and diffuse oedema. At the time, the boy had undergone an operation of removal of a subdural hematoma. After the examination and consultation, doctor Rigopoulos recommended an intensive functional rehabilitation therapy to improve the functions of the musculoskeletal system. It would include exercises with stretching of the external hip rotators (tensor fasciae latae muscle, semitendinosus muscle, posterior area of the semimembranous muscle, as well as strengthening of the external hip rotators, the gluteus maximus and muscles of the external pelvis), the sartorius muscle and hip biceps. After consultation with the doctor, who took the boy’s problems very seriously, his parents considered coming to Greece for treatment. The Charitable foundation “Neopalimaya Kupina” helped them with this. After 8 months Ilya and his father came to Medical and rehabilitation centre “Anagennisi” for treatment. Within 2 months of treatment the centre’s specialists and the boy, who very happily underwent all the therapies, had some wonderful results. Thanks to the logotherapists’ team’s effort, his salivation decreased, he could pronounce some sounds properly, the dynamics of the chewing and facial muscles got better, the depth and rate of breathing improved, the swallowing reflex improved, and the boy could finally eat chewy food. Occupational therapists & physiotherapists reduced the intense spasticity of the upper and lower limbs, improved the functions of the grasp reflex & increased the passive-active movements in the ankle, knee and hip joints. The operation, which seemed to be necessary before, could be postponed thanks to these results. In November Ilya’s little brother was born, so next year the whole family is planning to come to Greece all together. We love him and are waiting for him with anticipation!